This contemporary improvisational quilt is fun to piece and once you get the process, it goes very fast. 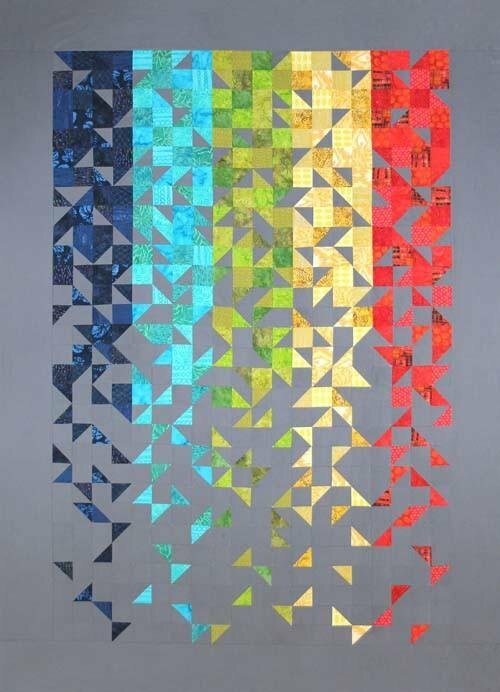 The blocks in this quilt are made from only one strip size (OSS). The cutting is super easy! You might notice that our sample pictures show the quilt rotated. You decide which way is up. There are 5 columns in this quilt. Each of the columns has 10 blocks. Thus, the quilt has 50 blocks. You make one column at a time. You will have lots of fun selecting colors for your columns. The background color stays the same in each column. After you finish the columns, you add one border and the quilt is finished! (You can omit the border if you like). The quilt finishes 57" wide by 80" long. The project pack includes the pattern and a pack of 2.25" Thangles.